"Elemental HERO Neos" + "3 “Neo-Spacian” monsters with different Attributes"
Must first be Special Summoned (from your Extra Deck) by shuffling the above cards you control into the Deck (you do not use “Polymerization”). If this card is Special Summoned from the Extra Deck: You can activate this effect; for the rest of this turn, your opponent cannot activate cards, also cards your opponent controls cannot activate their effects. Your opponent cannot activate cards or effects in response to this effect’s activation. Once per turn, during the End Phase: Shuffle this card into the Extra Deck, and if you do, destroy all cards your opponent controls. This card is the first Level 11 Neos monster. This monster appears to be a combination of Elemental HERO Neos and its Triple Contact Fusions. Elemental HERO Neos - Its horn on the mask, along with the white portions of its suit. Elemental HERO Magma Neos - Its left hand and right foot. Elemental HERO Chaos Neos - Its mask, right hand, and left foot. Also, its left hand has 5 fingers while its right hand has 4. Elemental HERO Storm Neos - Its hips. Elemental HERO Nebula Neos - Its rudders. The fins on its arms and legs also share a similar color scheme. The upper wings are a fusion of Chaos Neos and Storm Neos, while the lower wings consist of the wings and feathers from Magma Neos and Storm Neos respectively. 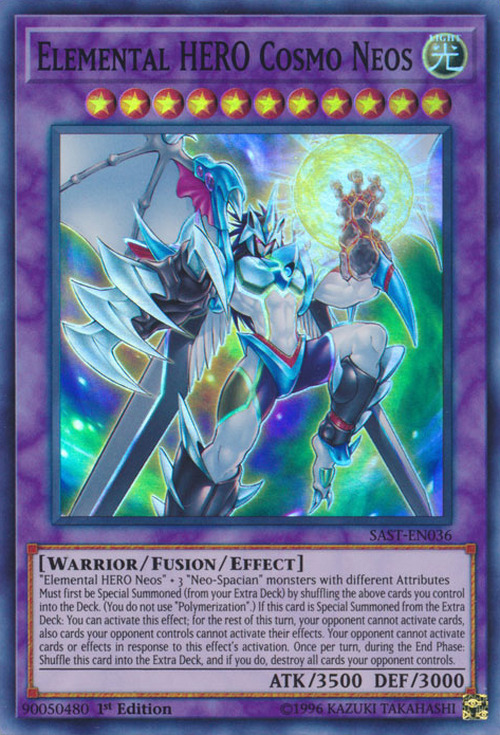 This card has the highest Original ATK and DEF of any “Elemental HERO” monster in the game. 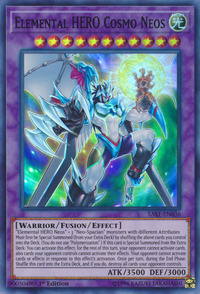 This card also tied with “Evil HERO Malicious Fiend” for the highest ATK of any “HERO” monster in the game.